Kuala Lumpur, 10 July 2014 – A voluntary organisation of The National University of Malaysia Medical Centre (UKMMC), SAHABAT UKM has received zakat contributions totaling RM300,000 from the Open University Malaysia (OUM) to help patients meet the cost of their medical care. The fund is to assist poor patients receive after care support which can be quite considerable even though the fees charged by UKMMC is minimal. The contributions was handed over by OUM Chancellor Tun Jeanne Abdullah to SAHABAT Chairman Puan Sri Eveline Anuwar. UKM Vice Chancellor Prof Datuk Dr Noor Azlan Ghazali speaking at the handing over ceremony said UKM through SAHABAT wants to ensure everyone of its patients can get the best medical care possible so that they can have an equal chance of recovery. The people sometimes forget that there are still those who struggle to get treatment because of the high cost of medical care. To have a complete recovery, a patient may need support equipments like wheel chairs or even implants but do not have the means for the follow-up treatments. SAHABAT makes sure that every deserving patient is not deprived of medical care just because they lack the financial means. 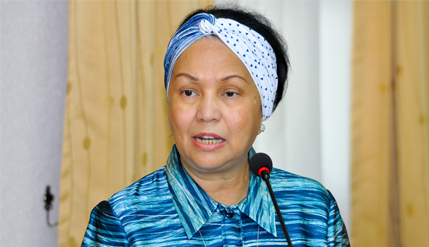 Tun Jeanne said people in their quest for success sometimes forget that there are those who are reluctant to get treatment because they cannot afford them. Sahabat can help in such instances. Present at the ceremony was OUM Vice Chancellor Prof Emeritus Tan Sri Anuwar Ali and Director of UKMMC Prof Dato’ Dr Raymond Azman Ali.